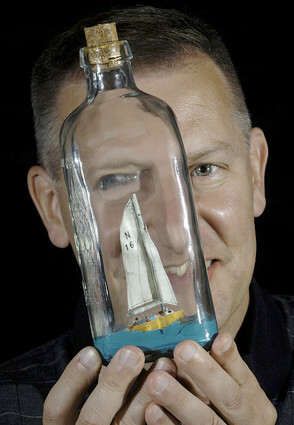 Bill Sheridan started making ships in bottles in 1981 during his senior year at the University of Connecticut. He had previously been an avid model builder of WWI airplanes and muscle cars, but became fascinated with the art of ship-in-the-bottle models after reading books by Don Hubbard and Jack Needham. He got the urge to start building ships in bottles due to an overabundance of empty bottles readily found in college dorms of that era. After attempting 3 or 4 models he gave up the hobby for a while and began work at United Technologies Corporation as an engineer. He was married in 1983 and started a family soon afterward. He now has a son and daughter both attending college at this time (2007). Bill loves sailing and has always been fascinated by ships and yachts. He has owned numerous small craft & day-sailors during the past 20 years. In the 1990’s he was a crewmember for larger cruising boats and participated in many races on Long Island Sound. Bill now owns a Newport 16 day-sailor and spends most summer weekend afternoons out on the water with his wife. Bill is currently the Design Chief of Mechanical Systems for the Pratt & Whitney Aircraft (PWA) division of United Technologies. PWA is a maker of commercial and military jet engines. 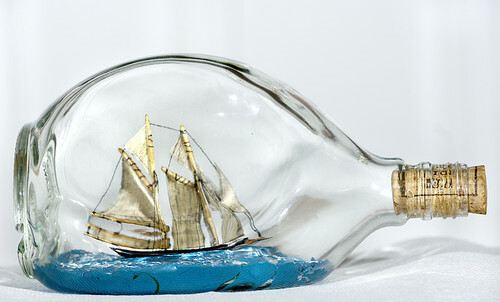 After a long hiatus, Bill started making ships in bottles again in 2006. He has produced about a dozen models including his early work. He has also written a book titled “Beginners Guide to Building Ships in Bottles” published in 2007, which can be found on www.Amazon.com or in Barns and Noble bookstores. The incentive for writing the book is based on the lack of young people who have tried the hobby. Bill’s book is a simplification of the traditional techniques in hopes that new modelers will try it and not be intimidated by the more intricate projects found in many of the currently available texts. He is a member of the Ship in Bottle Association of America and hopes to improve and sharpen his skills as he approaches retirement. 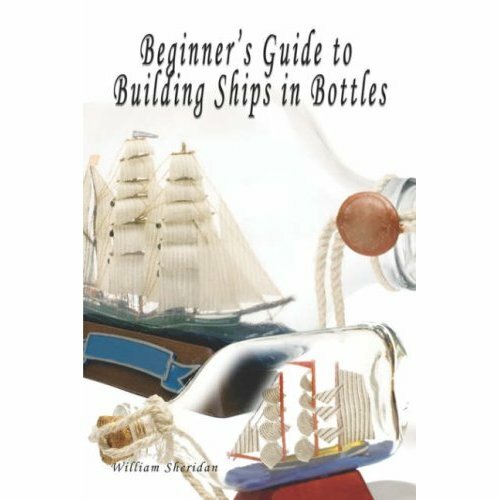 Engineer's Book Helps Beginners Build Ships In BottlesStory By JESSE LEAVENWORTHThe Hartford CourantAugust 29, 2007 In his new book, Bill Sheridan recommends Pinch Scotch Whiskey bottles as the best containers for novice modelers.